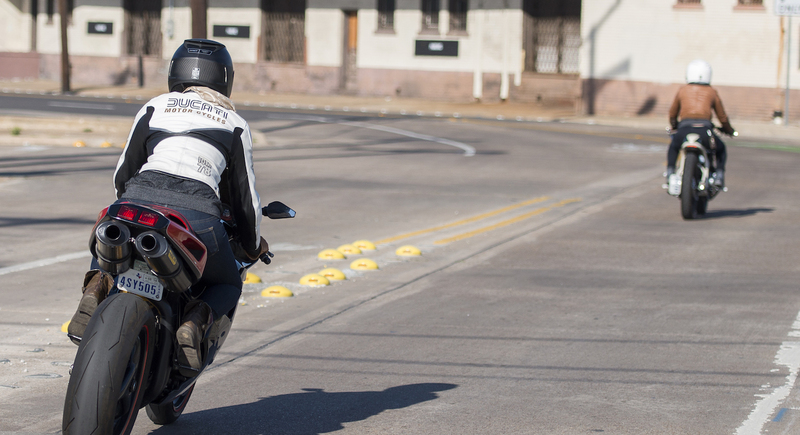 When you ask motorcyclists why they ride, you’ll get a variety of answers. Some love to ride for the speed, others the camaraderie, and others say they love the freedom of the open road. Whatever the rationale, though, there’s always one thing that brings riders together: the joy of becoming one with your machine. On the surface, these are very different descriptions of riding. But underlying both of these descriptions is the idea that you and your motorcycle are somehow connected — spiritually, viscerally. The first time I felt this sense of connectedness, I had just attempted my first counter-steering swerve for my MSF course. The quick swoosh-swoosh of shifting directions, the instant response from the bike as it flowed effortlessly with my hips… It didn’t matter that I stalled out moments later, or that I didn’t actually swerve far enough to avoid the “obstacle.” That first brush with “being one” with my motorcycle had me hooked. Regular readers know that I have a penchant for (or maybe an obsession with) trying to understand the underlying reasons we humans love motorcycles. And in my defense, it’s a fascinating question. Motorcycling breaks the “rational human” mold ’90s-era economists were so fond of: riding is dangerous, it can be expensive, and we don’t (usually) gain anything of economic value for doing it. So why do so many of us not only choose to ride, but get passionately and enthusiastically entangled with it? Recently, I came across some research that I think helps shed some light on the psychological foundations for why a subset of a supposedly logical species fell so madly in love with going fast on two wheels. And it has to do with the unity between (wo)man and machine. Archaeologist Timothy Taylor even believes that the advent of these complex tools is what caused our australopithecine ancestors to eventually become the genus Homo, and later Homo sapiens. His evidence is that the earliest chipped stone tools are dated to have been around as long as 2.5 million years ago, while the Homo genus only emerged 2.2 million years ago — a total gap of 300,000 years. The second important idea in this exploration is the idea of peripersonal space. Studies have shown that the human brain uses three different “neuronal representations” to represent the space around us, based on the behaviors we can perform in each environment. There’s the personal space, which is the body itself, and the extra-personal space, which is the area around us that we can hear and see. And within the extra-personal space, there’s the reaching space, which encompasses the area in which you could reach an object without moving your body. That’s the area known as peripersonal space. Studies have also shown that when people use a tool, their peripersonal space expands to include the area that the tool allows us to interact with. This indicates that our mental construct of our physical selves is extremely malleable, and can expand to encompass a tool. In the early 2000s, a team lead by Martin Nicolelis taught a rhesus monkey named Idoya to operate robots with her mind, using what they called a brain-computer interface. At this point, we’ve established that human evolution is inextricably linked (and perhaps indebted) to complex tools, that the human mind changes its construct of the space around its body to encompass a tool being used, and that (in monkeys, at least) the brain can actually treat tools as part of its own body. To me, it follows that all of these concepts go together. Can you imagine how difficult it would be to use a tool if it didn’t feel like an extension of yourself? We could have never developed something as complex as an engine, which requires us to use tools carefully and precisely. And perhaps, this intimate relationship with our tools is one of the reasons we love motorcycles so much. After all, they take advantage of our capacity for “tool expansion” like nothing else does: riding is a total-body experience, which requires all our extremities and mental faculties to work seamlessly with the machine. I’m no evolutionary theorist, but maybe we evolved so this kind of unification with a tool feels good. After all, evolution is famous for rewarding behaviors that contribute to the continuation of our genes. Complex tools can be difficult to master — to achieve that “flow” point at which the barrier falls away and you and the tool become one. Maybe those of us still around are the ones whose ancestors responded positively to feelings of mastery and tool-unity, since it brings us closer to the fluency we need to use complicated tools to the best of our abilities. Of course, our genes didn’t have the foresight to see that many of us would use this fluency to fly down paved asphalt at 80 miles per hour 😉 But this exploration might at least begin to explain why many humans find riding motorcycles deeply and intrinsically rewarding, and why we will continue to do it for as long as we can. Motorcyclists tend to be portrayed as thrill-seeking adrenaline junkies. But we both know (and psychology research agrees) that’s not the whole story. And the hits just keep on comin’. Nicely done, LT. This blog is, among other things, a mind-expanding experience. I maintain that you should go for a doctorate in “Motocycology” (REALLY wish I had thought of that). When you’re ready – perhaps when you’ve completed the rebuild and aggregated all your thoughts and analysis from that experience – maybe consider giving the TEDx circuit a go one day. What you’re doing can translate to many themes. Ride on, and Write on, because your Right on! Yes, the review paper on peripersonal space and body schema is quite dense! But it has lots of interesting nuggets. I honestly think that body schema might be slightly more relevant to motorcycles, but the bulk of the research that was covered in this paper had to do more with peripersonal space, and anyway the authors were arguing that they were likely part of the same system. Anywho, I’m glad you found it interesting as well. And — you’ve probably heard of australopithecines before, “Lucy” was an early australopithecine 🙂 Though I don’t think I’ll ever be able to spell it correctly the first time hahaha. TEDx is a good idea! I am not always the best public speaker, but it’s easier when it’s something I’m passionate about. And motorcycles is definitely included in that category. Thanks as always for your excellent words of encouragement! Ah yes, the “A” Piths, Southern Apes. With that in mind imagine just how exhilarating it would be to swing with great abandon through the Jungle and thick forests again, the wind in our face, the momentum propelling us from one branch to the next, never confident that we will secure another as firmly and articulately as the last, the pure joy of physical exertion coupled with the ever consuming fear of falling between the cast off thru space and acquisition of a relative firm but temporary hand hold multiplied by fleeting visions of the predators below eager to pounce should we fail miserably in our heart pounding brachiational foray. The meditative quality of the best riding is what keeps me in the saddle – in a wired world determined to drive one mad, the sense of balance and flow that happens on the best motorcycle rides really is inner peace. This is the post that got me hooked. I read almost all your blogs but have shared and came back to this one several times! This is one of my favorites too! I find the concept so interesting… I could nerd out on it all day. It’s been awhile since I published this one… might be time for another soon! 😀 Thanks Raphael! Thank you for a great article. Enjoyed the strategic way you combined perspectives on psychology, philosophy and practicality associated with riding and relating to a motorbike.